Ford has announced that its all-new Mustang will get a choice of either a 310PS 2.3-litre four-cylinder or a 435PS 5.0-litre V8 engine when it goes on sale in 2015. The final specification for the UK car is to be announced nearer its on-sale date, but Ford has confirmed that both the engines will be offered in Britain. The entry-level 3.7-litre V6 offered in the US won't make it here. The 2.3-litre EcoBoost four cylinder has been designed to combine fuel economy with performance, using much of the technology seen in the smaller 1.0-litre Ecoboost petrol engine, including turbocharging and low-friction materials. The V8 is much less sophisticated, but a large-displacement V8 fits with the Mustang ethos. The new Mustang gets fully-independent suspension front and rear, which means it should have a good blend of ride and handling characteristics – not attributes normally associated with American muscle cars. Weight distribution is fairly evenly balanced and – for Europe – all cars get performance Brembo brakes and tweaked suspension as standard. 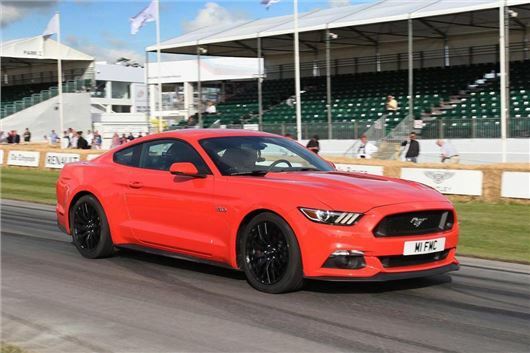 The all-new Mustang is to appear at the Silverstone Classic event on 25-27 July, leading a parade of more than 160 classic Mustangs from 50 years of the ‘Pony car’. The first 500 European Mustangs were made available to order on May 24 and were reserved within 30 seconds. 130 of those are destined for the UK and will arrive in early 2015 – but orders are not limited to that number and more UK cars will be available.